We keep receiving dozen of mails every week for providing Free trials / research reports for our well known subscription services - Hidden Gems and Value Picks. For the interest of our paid members, it is not possible and our readers might get disappointed after knowing this fact. However, we are pleased to inform you that our team this month has reiterated buy on our earlier Hidden Gem - Dec 2010 stock recommendation which we are sharing with all our readers in this post. Saral Gyan equity analysts have reiterated "BUY" on Piccadily Agro Industries Ltd (PAIL) [BSE Code: 530305] at current market price of Rs. 40.2 for price target of 120 over a period of 12 to 24 months. We would like to inform our members that our team recommended Piccadily Agro Industries Ltd (PAIL) 3 years back in Dec-2010 at price of Rs.36. Since then company top line as well as bottom line has been doubled with consistent revenue growth from distillery business where as stock is available near to our Dec-10 recommended price. Piccadily Agro Industries Ltd was incorporated in the year 1994. The company's principal activity is to manufacture sugar and their by-products. They operate in two segments, namely sugar, which is engaged in the production of sugar, molasses and bagasse, and other, which is engaged in the manufacturing of liquor. Their plant is located at Bhadson in Haryana. Haryana State Investment Development Corporation and Piccadily Hotels Pvt Ltd and their associates promoted the company. They set up a new plant for the manufacture of white crystal sugar refined sugar with the installed capacity of 2500 TCD along with the facilities for co-generation of 6 MW power at Bhadson in Haryana. During the year 2002-03, the company completed the erection of semi kesener and boiler and functioning from February 2002. During the year 2002-03, they expanded the crushing capacity from 2500 TCD to 5000 TCD at their plant in Bhadson, Haryana. The company further expanded its business & set up a Distillery Unit with a installed capacity of 60 KLPD in year 2007, which has further been expanded to 90 KLPD. The company started commercial production in their ENA unit with effect from April 28, 2009. The Sugar Mill Crushed 4142682 quintals of sugar cane during the season 2012-13 & produced 421820 quintals of sugar as against 3660561 quintals of sugar cane during the season 2011 - 12 & produced 343915 quintals of sugar in 2011 - 2012. The mill also produced 192900 of molasses in the year 2012 - 13, molasses is a major raw material used in the Distillery unit of the company. The company has completed implementation of the Malt Plant and maturation hall along with the addition of 8 ton boiler to provide necessary steam to the malt plant, for the manufacture of 10 KLPD Malt Spirit to be used for the production of Indian made foreign liquor (IMFL) in the month of Nov'12. Company also imported about 12112 Oak wooden barrels for storing Malt Spirit for maturation. The unit has produced 475359 bulk liters of malt spirit till the end of FY 13. 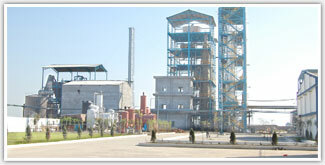 Company distillation plants are designed & executed by M/s Destichem & Praj Industries Ltd. Along with this the company also installed fermentation house to cope up to supply quality wash, & are gradually expanding the existing unit by inducting ultra modern machineries. Further two Grain plants of 100 tons / day Grain handling capacity each have been setup for distillation. The company has also set-up a food grade Co2 plant supplied by Wittaman of USA. The company has set up an automatic 750 ml & 180 ml Pet Bottle plant. The unit is producing pet bottles to cater to the distillery’s own consumption. 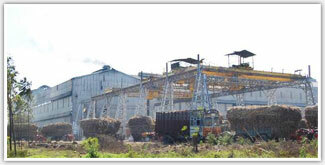 At the end of FY07, the company was only into sugarcane crushing and thus into the production of raw sugar, however they had started with the setting up of liquor facility. So, till FY07 they were largely a loss making company. Turning point came in FY08 when company entered into distillery business. For FY08 the company had started with the liquor production and sold some 2.17 million cases. In that year the company made a net profit of just Rs 12 million but that was on account of 50 million loss from Sugar Division. At the end of FY08 the company had some 270 million capital work in progress, so they were still expanding their liquor facility. In FY13, company has sold nearly 8.4 million cases of country liquor (almost 4 times of what company sold in FY08) and their brands of the distillery i.e. Malta, Sofia, Ginn and Marshal continue to be well accepted by the people and have become popular brands in the state of Haryana. The distillery division has achieved a turnover of Rs. 2050 millions (205 crores) in FY 2013 and contributed 62% to total sales of 3317 millions (331 crores). Now, if we look at first 9 months performance of 2014, company has achieved total sales of 2765 millions (276.5 crores), out of which sales of 1725 millions (172.5 crores) is achieved from distillery division where as sugar division contributed 1115 million (111.5 crores) of sales. Distillery division contribution in sales of first 9 months of FY 2014 is 60.7% . Since 2009, company is making profits and sharing it by paying regular dividend to share holders, dividend payout average during last 4 years is above 15% and dividend yield is above 2.5%. Compounded sales growth during last 3 years is 25.04%, same during last 5 years is 23.25%. Compounded profit growth is also impressive, profit CAGR during last 3 years is 25.71%, same during last 5 years is 70.4%. 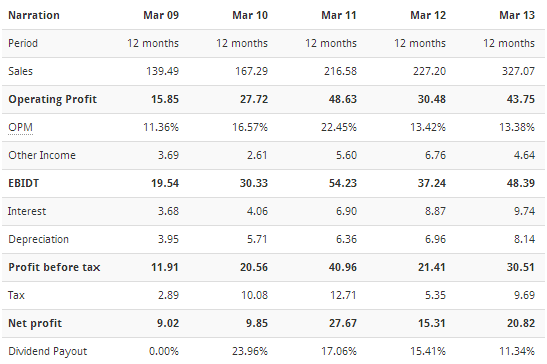 ROE (Return on Equity) is above 25% during for last 5 years. Mr. Venod Sharma was a leader of Indian National Congress party from Haryana. He was a Minister of State in the Ministry of Civil Supplies, Consumer Affairs and Public Distribution in the Narasimha Rao cabinet. Mr. Kartikeya Sharma is the younger of the two siblings of Mr. Venod Sharma. Till late FY 07, Mr. Siddhartha Vasishta better known as Manu Sharma was looking after the operations of the company, however post his conviction in Jessica Lal Murder Case, Mr. Kartikeya Sharma started looking after the affairs of the company. Mr. Kartikeya is a young and energetic entrepreneur and under his guidance the company has been successfully steered towards liquor production. 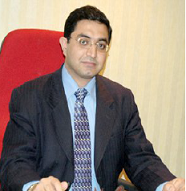 He has been instrumental in bringing about a radical change in the operations of the company. i) Purchased 89% share holding of M/s. Nirvana Biosys (P) Ltd.
Piccadily Agro Industries Ltd has informed BSE that Company has purchased 89% shareholding of M/s. Nirvana Biosys (P) Ltd, which has become a subsidiary of Piccadily Agro Industries Limited. M/s. Nirvana Biosys (P) Ltd incorporated in the year 2008 has set up a plant of winery at Bawal, Distt. Rewari in the State of Haryana as a joint venture with E.C. Oxenham & CY. Ltd lle, Maurice-winemakers for over 75 years with a French Lineage. The Company has a distinction of setting up of a first such winery in the Northern India. M/s. Nirvana Biosys (P) Ltd is committed to producing affordable table wines for the Indian markets that are comparable to French & Italian Levels and has also introduced other unique variants that have never before produced in this region. The range includes Red, white, Sparkling, Port, Lychee, Mango , Rose & Herbal wines. 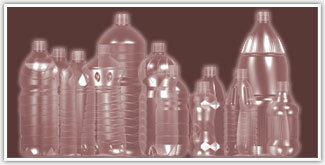 The products of Company are selling in more than 12 states of India along with various CSD canteens. This will enable the Company to expand the product range of the Company & will substantially affect the profitability of the Company. This is a good strategic move by the management which is expected to further strengthen the liquor business of the company in coming quarters. Company revenue from its distillery business has grown by more than 400% in last 4 years. Company posted total sales of 205 crores in FY 2013 from distillery business, the same was 48 crores in FY 2009. We expect total revenue from distillery business will cross 300 crores in FY 2015 considering their existing product portfolio and recent acquisition of Nirvana Biosys (P) Ltd.
Company has increased its focus on liquor business and is taking all necessary steps to grow at a healthy pace. As illustrated in table below, revenue contribution from liquor business increased from 33% to 61% during last 4 years where as sugar business contribution has decreased from 66% to 39% during the same period. Profit contribution from liquor business is above 100% in first 9 months of FY 2014 as sugar division has incurred loss of 4.6 crores. Currently, in BSE and most of the financial websites, Piccadily Agro Ltd is featuring under sugar sector. This could be one of the strong reason why this stock is trading dirt cheap with so attractive valuations, investors have yet not realized that this Hidden Gem major revenue and profits are generated from liquor business and it is not purely a sugar company. As more than 60% revenue is generated from distillery business since last 3 years, it would be fair to compare Piccadily Agro Ltd with peer group companies from distillery business instead of sugar segment. 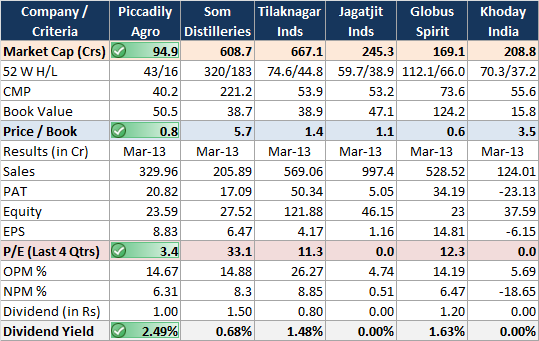 As illustrated in above table, if we look at fundamentals of profit making companies like Som Distilleries, Tilaknagar Industries and Globus Spirits from distillery business, we find huge gap in terms of valuations. These companies are trading with trailing PE multiple in the range of 11 to 33 whereas Piccadily Agro Industries is currently available at trailing PE multiple of 3.4 which indicates huge scope of re-rating in stock price. On other important parameters also, Piccadily Agro Industries outperform peer group companies. At CMP of 40.2, stock price to book is 0.8 and dividend yield is maximum at 2.5% among peer group companies. Market capital of PAIL is below 100 crores whereas Som Distilleries and Tilaknagar Industries have market cap above 600 crores with lower EPS. All these key parameters makes Piccadily Agro Industries a better investment opportunity with favorable risk reward ratio. i) Piccadily Agro Industries Ltd is primarily known as Sugar segment company, however they have set a strong base in Liquor segment and are poised for exponential growth considering the numbers that the company has been reporting. We expect the company to go through a phase of re-rating in line with the breweries industry over the period of next 1-2 years while their organic growth and expansion plans of liquor facility will ensure the robust growth in earnings. ii) In current financial year, profits are mainly because of distillery unit where as company incurred losses from its sugar business. Knowing the fact that sugar is a commodity and is a cyclic business in nature, entire sugar industry is going through the bad phase due to depressed sugar prices due to excess supply of sugar and increased in raw material cost (sugarcane). Once sugar prices turn favourable, we will see company delivering strong bottom line. iii) Looking at valuations, we find PAIL is trading at extremely cheap valuations compared to peer companies and is currently available below its intrinsic value. Considering the fact that company is generating entire profits from its liquor business and incurred loss from its sugar business which is cyclic in nature, stock looks undervalued and offers good upside potential with limited downside risk in medium to long term. iv) Company is making profits since last 5 years and has paid regular dividend to share holders, dividend payout for FY 2010 was 20% and 10% for FY 2011, 2012 and 2013. At current market price of 40.2, dividend yield is at 2.5%. v) We believe that management can declare 20% dividend for current financial year based on strong earnings posted in first 3 quarters of current financial year. At CMP of Rs. 40.2, dividend yield will be 5% (considering 20% dividend for FY 2014) which can bring good price appreciation in stock price in near term. vi) Promoters holding is 70.9% since last 3 years, need to mention that Promoters have increased their share holding aggressively in 2009 and 2010 from 59.2% to 70.9% at higher stock price which shows the confidence of promoters in their business. vii) On equity of Rs. 235.85 million the estimated annualized EPS for FY 2014 works out to Rs. 12.4 and the Book Value per share is Rs. 50.65. At a CMP of Rs. 40.2, stock price to book value is 0.8. The scrip is trading at 3.2X FY 2013-14 and 2.1X FY 2014-15 estimated earnings which make it attractive buy at current market price. viii) We have interacted with management and believe that results will meet our expectations for FY 14 & FY 15. In last financial year, company has achieved total sales of 330 crores with profit of almost 21 crores where as company market cap is only 94 crores, market cap to sales ratio stands at 0.3.
ix) We expect company will continue to deliver similar growth in top line and bottom line like that of last 3 years from its distillery business. Sugar business may not perform well in near term due to depressed sugar prices but can add significant bottom line from second half of FY 14-15 which will help company to improve its operating margins. x) It seems that PAIL is overlooked by investor fraternity considering that this company belongs to sugar industry, where as company is now generating more than 60% of its revenue from its liquor business. Hence, if we compare its valuation with peer group companies like Som Distilleries, Tilaknagar Industries and Globus Spirits which have similar operating profit margins and currently trading with PE multiple in the range of 11 to 33, we find Piccadily Agro Industries extremely undervalued. If we consider fair PE of 10 like other companies from the same sector, stock price for Piccadily Agro works out to be Rs. 120, where as today's closing price of PAIL is Rs. 40.2.
i) The company operates in two segments i.e. Sugar and Liquor. For first three quarters of FY 14, the Sugar segment of the company has played a spoil sport and has affected the profitability of the company. Sugar being a cyclical and highly regulated segment can affect the future profitability as well. ii) Mr. Siddhartha Vasishta, popularly known as Manu Sharma was convicted in the Jessica Lal Murder case and is serving life imprisonment. His link with the company may keep some conservative investors at bay. iii) The Indian Liquor Industry is highly regulated and there’s even a ban on direct advertisements which may affect the future growth of the industry. Considering recent developments, business growth visibility, profitability from distillery business and extremely attractive valuations, Saral Gyan Team reiterates “BUY” on Piccadily Agro Industries Ltd. at current market price of Rs. 40.2 for price target of Rs. 120 over a period of 12-24 months. Suggested Allocation: 5% of your Equity Portfolio. Note: Opportunity missed is an opportunity lost. Subscribe to Hidden Gems (Unexplored Multibagger Small Cap Stocks) and Value Picks (Mid Caps with Plenty of Upside Potential) and start making educated investment decisions by investing in fundamentally strong small and mid cap companies. Click here to know more about our services and annual subscription charges. Click here to read complete research report circulated on 19th Dec 2010 to all Hidden Gems members.